Persona is a simple tool used to stimulate divergent thinking. One of many CPS applications, it has been another successful implication into the TENT project. 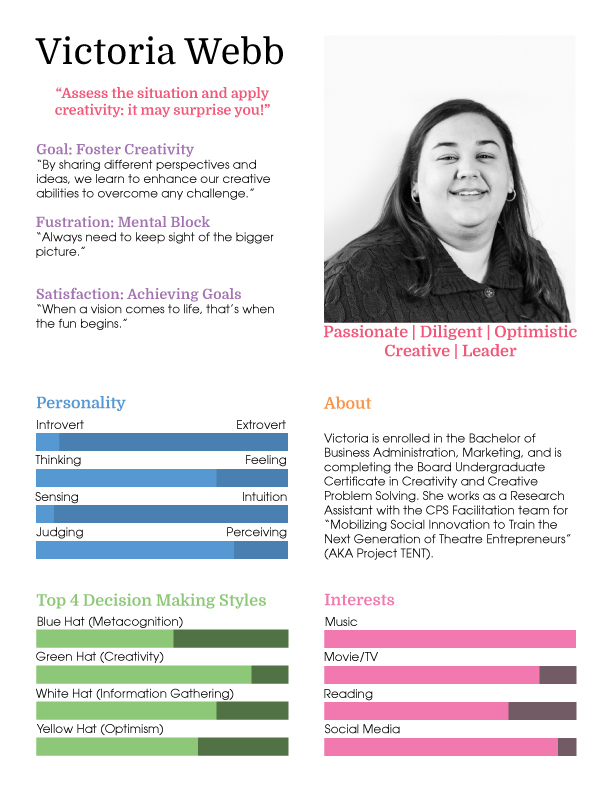 Brittany German (BA, Creative Writing & Publishing) and Victoria Webb (BA, Business Administration and Marketing) teamed up to show how you can use a Persona to better understand a target market. Let’s test this persona, shall we? Let’s put this persona to practice with the hypothetical question: what new event or workshop would be most beneficial to imaginative students? Victoria represents one of the audiences we need to consider when exploring the different perspectives of this question. She is driven by her innate capacity for creativity. Her overflowing knowledge can be instilled in others or used to pole vault over the high bars. Victoria is already comfortable with this, so our focus should be on ameliorating her skills, not producing them. This doesn’t necessarily mean something in the arts spectrum though, her visionary talents can be applied to any situation to make it more intriguing and fun. Perhaps a helpful event would involve something that could benefit from a novel take on the mundane? The next thing to consider is Victoria’s frustration: mental blocks. Victoria is always coming up with unique ideas but sometimes the brain just stops. This often happens in solitude. Maybe if Victoria were part of a focus group working as a collective machine, they would be able to build off of each other’s ideas until they’re reaching into space! Since Victoria is an extrovert, this would be an easy fix. What’s more is a magnetic pairing of Victoria with introverts. Then not only does Victoria have others to share ideas with but they will also have an extrovert exposing them to situations they might otherwise have missed out on. Then we need to consider what Victoria wants to get out of this. Her satisfaction is achieving her goals. An important part of any event is the achievement of hopping from lily pad to lily pad leading to one big, final cannonball.This persona wants to see how her efforts come together in the end. So, this new event needs to be a long-term one where little tasks work towards one big splash! Extroverted students, like Victoria, group together with a few Creative Writing students, who are known to be quite introverted. Like the pairing between art and business, this contrapuntal couple is bound to benefit each other. Throughout a semester, Victoria will work with four or five writers towards planning an end of semester public reading. The writing students will build poetry or prose to be read aloud. With Victoria’s guidance they will promote their upcoming event, plan their venue and audience, and generate buzz! Victoria will take the lead on approaching these steps with innovation and will have her group of minions to bounce ideas off of, because it is guaranteed the writers have ideas to share. To add an element of competition or a higher level of success, this end of semester reading can become a competition. Since Victoria represents a cohort of business students, they can each take part, organizing groups of their own and fighting for the loudest applause at the end! She’s been an integral part of the TENT project, fastening relationships between people and assisting in running CPS tools. Find out more ways to facilitate events or meetings by visiting Victoria’s LinkedIn.You might even make a new friend!